Urinal mats can help guarantee a cleaner restroom. These precautionary tools prevent urine from puddling under urinals — an unpleasant sight for any guest to see walking into the restroom. 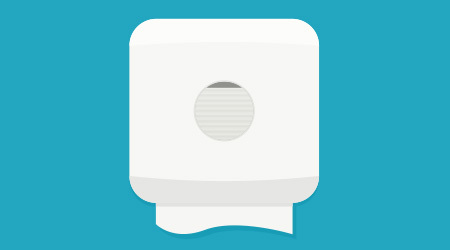 But in addition to improving a restroom’s appearance, urinal mats also keep them smelling clean. In fact, it’s a common misconception that odor in a restroom stems from the urinal. The source of odor actually comes from dried urine that is on the floor. Unless cleaning staffs are allowing proper dwell time for disinfectants, nightly mopping is not going to eliminate urine deposits or decrease the odors that they can create. At the same time, mats aren’t going to get rid of current odor troubles (cleaning staffs will still need to disinfect these floors). But starting with a clean slate, mats will prevent future odors from becoming a problem. Mats are designed to capture and remove odors, not mask them with a fragrance. While scented mats are available, sales indicate that end users vastly prefer to go without a fragrance. Left untreated, urine deposits will not only smell bad, but they can cause lasting damage to floors. When urine is allowed to puddle under fixtures, the uric acid and uric salts found in the urine can damage the floor finish or seep into grout, stone and wood floors, causing irreparable damage. Mats will protect floors if installed and replaced at proper intervals. This will enable cleaning staffs to reduce the number of times they need to strip and recoat restroom floors, saving on labor. Facility managers and building owners will also find that floors have a longer lifespan. Puddles left on the floor aren’t just unsightly and unsanitary, but they are also unsafe. Users walking by can slip and fall on the wet floor, says Charlie Flurry, president, Absorbcore, North Olmsted, Ohio. Mats are ADA compliant and provide another layer of safety in the restroom. There are many benefits to using urinal mats, but they are only effective if properly maintained. Urinal mats stop working once they are saturated. Mats are designed to last approximately 30 days, but they may need to be replaced sooner depending on restroom traffic. Heavily-trafficked restrooms will probably need mats changed every five to seven days, says Barnes. To help outline a proper change-out schedule, there are mats available with a built-in replacement sensor; otherwise, cleaning staffs should determine a replacement schedule and stick to it. When it comes time to replace, mats are simply thrown away. But even though mats aren’t recyclable, they can still be considered green. Some mats are biodegradable, meaning the entire mat — pad, backing and frame — will break down in a landfill in less than five years. Click here to learn about urinal mat styles and compositions.